Sure, there are a lot of rides at Yesterland Park, but there’s also a ride at the Yesterland Hotel. It’s called the Looking Glass elevator. It’s a short ride up the side of the tallest building in the county—11 stories. The ride is non-stop. The Looking Glass elevator only has doors at the ground level and the top floor. 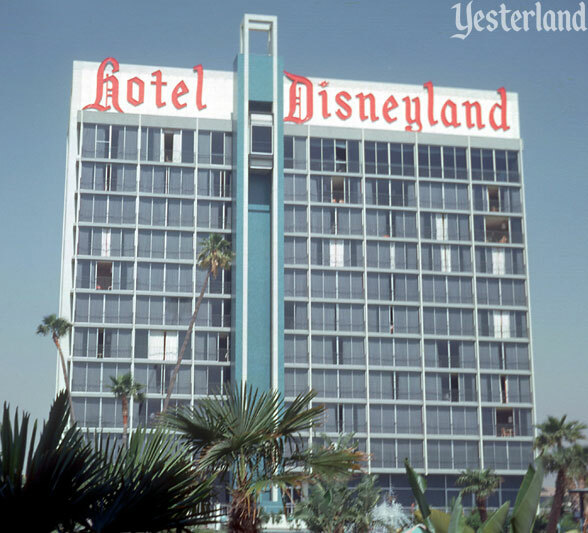 You’re a guest at the Yesterland Hotel. In your room, there’s a copy of Check-In, the hotel’s own magazine. Its cover shows a sweeping vista. Colorful fireworks light up the sky. But why just stare at the cover, when you can enjoy the real thing? San Francisco has The Top of the Mark, the well-known rooftop lounge at the top of the Mark Hopkins Hotel. In a play on words, the Yesterland Hotel has The Top of the Park. On your way up in the Looking Glass elevator, you’ll have a great view of the hotel’s spacious grounds, its Olympic-size swimming pool, and its original two-story lodgings. 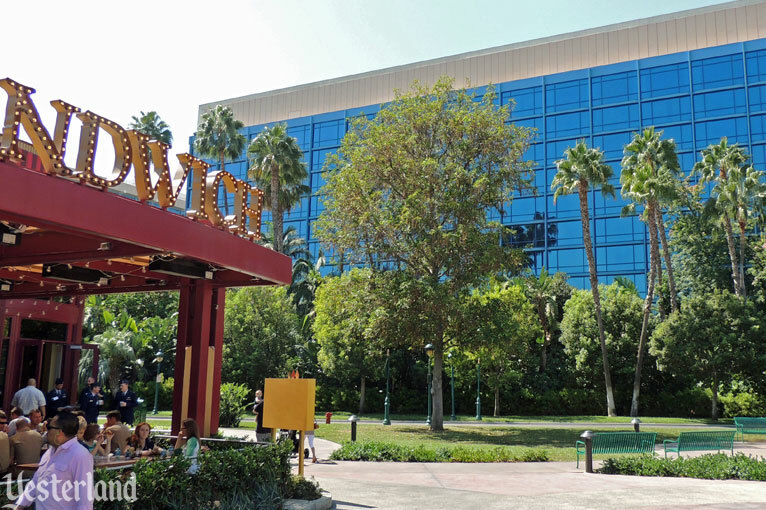 Beyond the hotel, you’ll see the parking lot and taller landmarks of the park. This ride doesn’t open until 4:00 p.m. But when you get to the top, you can stay for hours. You’ll want to dress up a bit. This is an elegant spot. Relax in high-backed booths, sipping cocktails while enjoying a performance by a vocalist, pianist, or small combo. The mood is romantic. But don’t get so caught up in the cocktails, entertainment and conversation that you forget to take in the fantastic view. You don’t have to be a guest at the hotel to enjoy The Top of the Park. Park guests seeking an adult beverage come here too—if they don’t stop at one of the hotel’s many other bars first. The Top of the Park also attracts local residents seeking a bit of nightlife. The Looking Glass elevator makes it all possible. As a prominent architectural feature, it calls attention to The Top of the Park. It keeps the rooftop lounge patrons separate from guests going to their rooms. And it provides a fast, fun way to get to the Top. 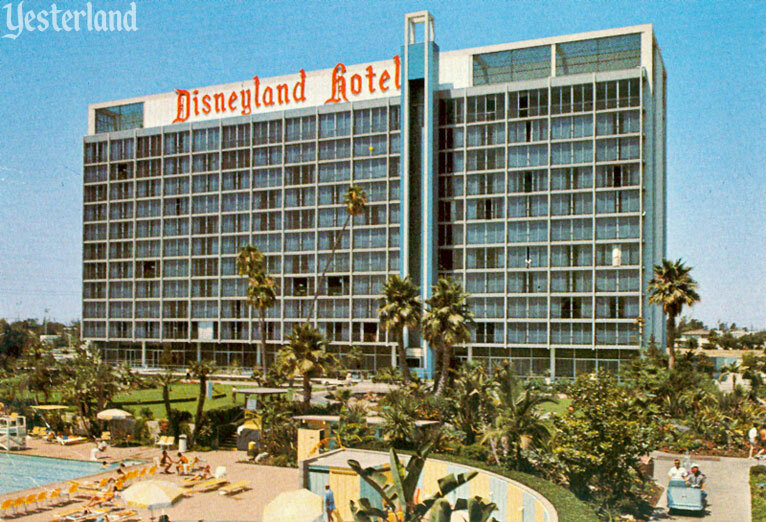 The Tower Building at the Disneyland Hotel, with the Looking Glass elevator and The Top of the Park, opened in 1962. The hotel had opened seven years earlier with just 104 rooms and no building taller than two stories. 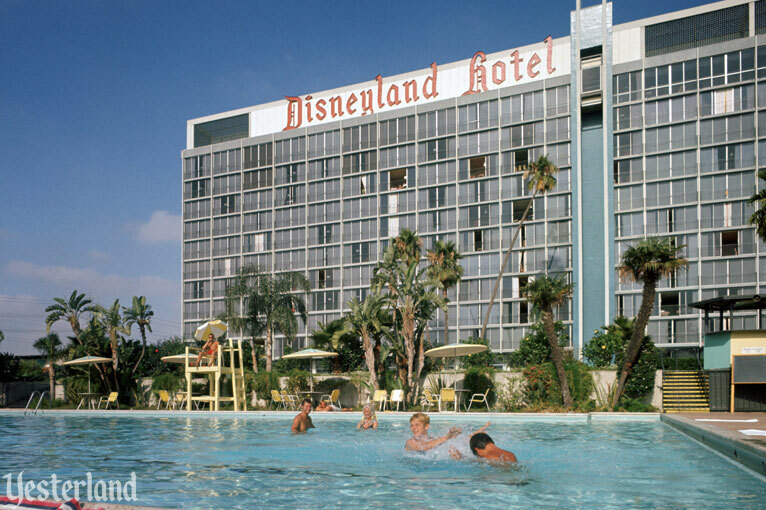 With the opening of the Tower Building, the Disneyland Hotel grew to 450 rooms. 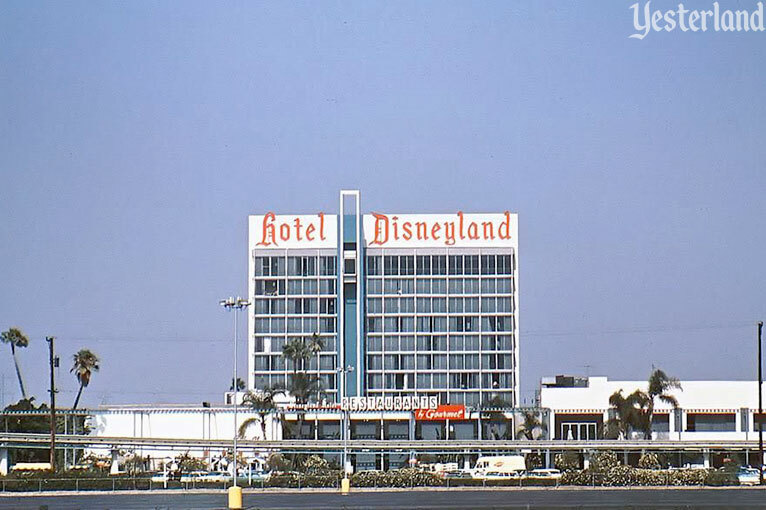 These days, with high-rise office towers and hotels throughout Orange County, it’s hard to believe that the 11-story tower at the Disneyland Hotel was ever the county’s tallest building. But in 1962, that’s what it was. 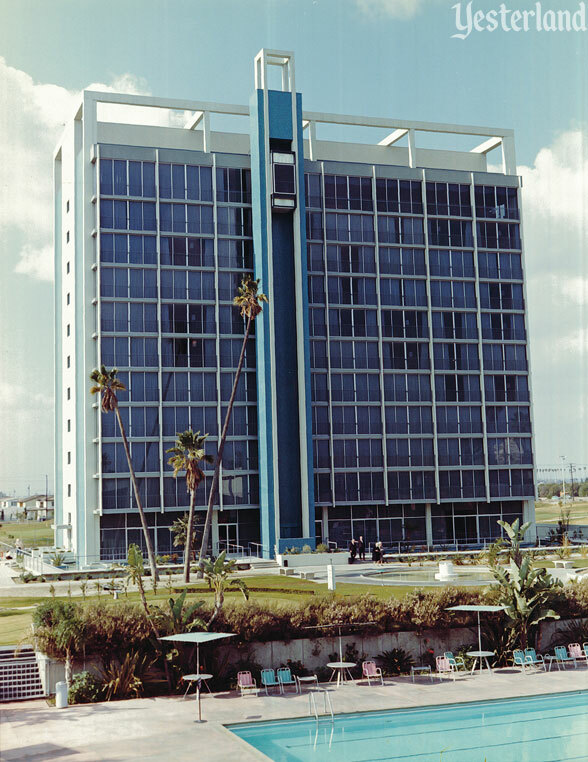 As originally designed and built, the Tower Building was an elegant work of Modern Architecture. Its top was clean and simple. The glass elevator structure, asymmetrically positioned on the outside of the otherwise symmetrical tower, extended above the roofline. It was a defining vertical feature of the Tower Building—the modern equivalent of a steeple on a church or a clock tower on a traditional civic building. 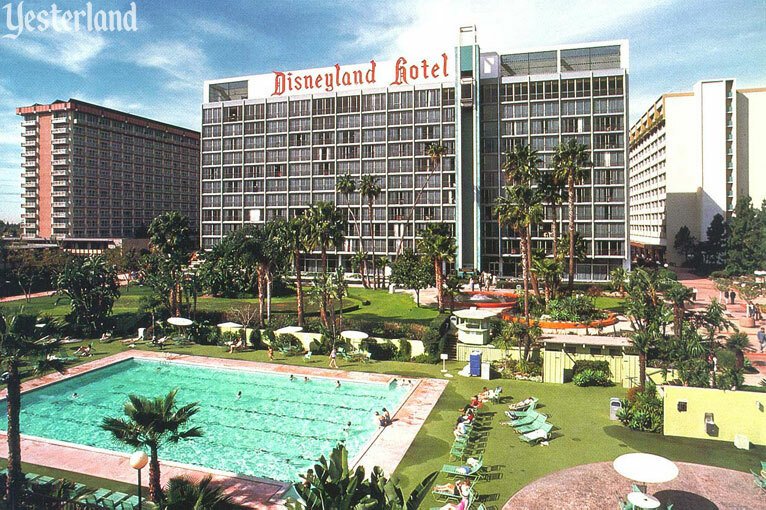 The hotel was always called the Disneyland Hotel, but the elevator sliced the front of the building into a narrower left side and a wider right side. The words were placed where they fit. 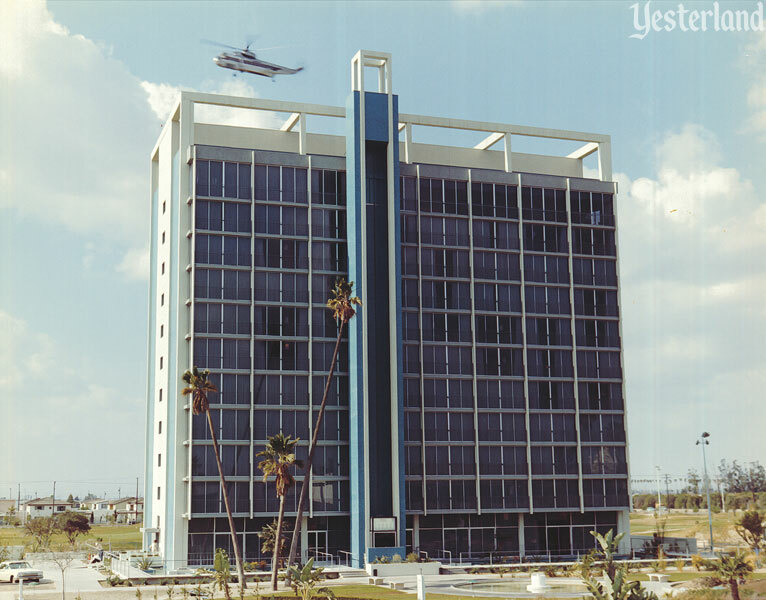 The amount of space for a sign changed in 1966 with an addition to the Tower Building that doubled its width and added 150 rooms. 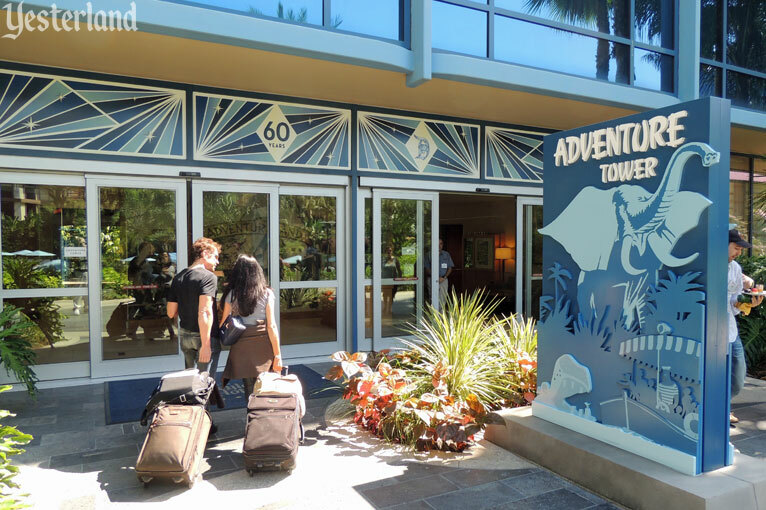 The words of the “Hotel Disneyland” sign could finally be flipped to the correct order. 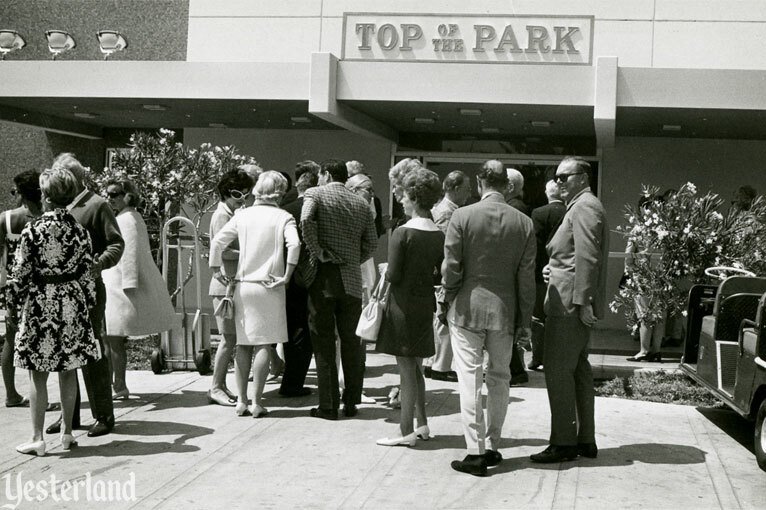 The Looking Glass elevator and The Top of the Park lounge lasted through the 1970s and most of the 1980s. 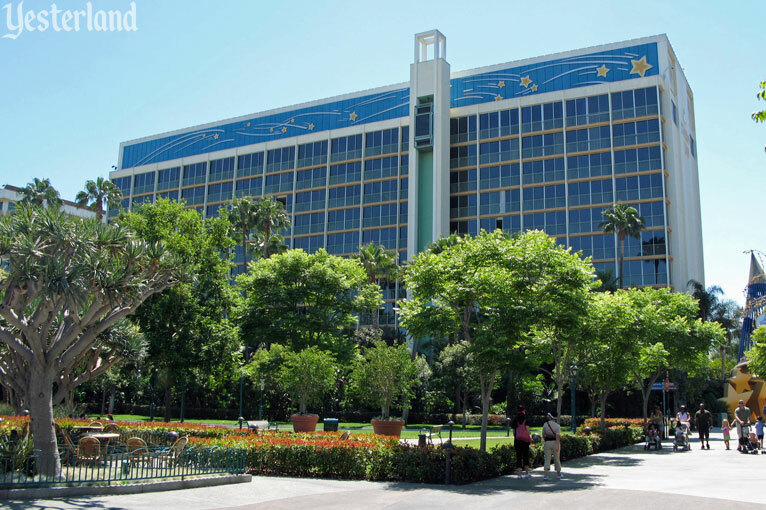 In 1988, The Walt Disney Company finally acquired the Disneyland Hotel by purchasing Wrather Corporation, the company that had always owned it. As part of a major renovation of the entire property, Disney closed The Top of the Park in 1989. 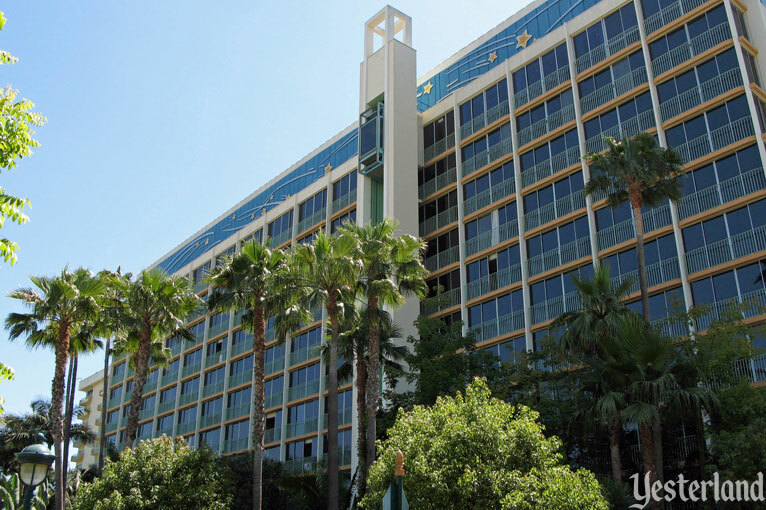 Disney’s plans included converting the top three floors of the Sierra Tower into concierge rooms and providing a concierge lounge on the 11th floor for those guests. 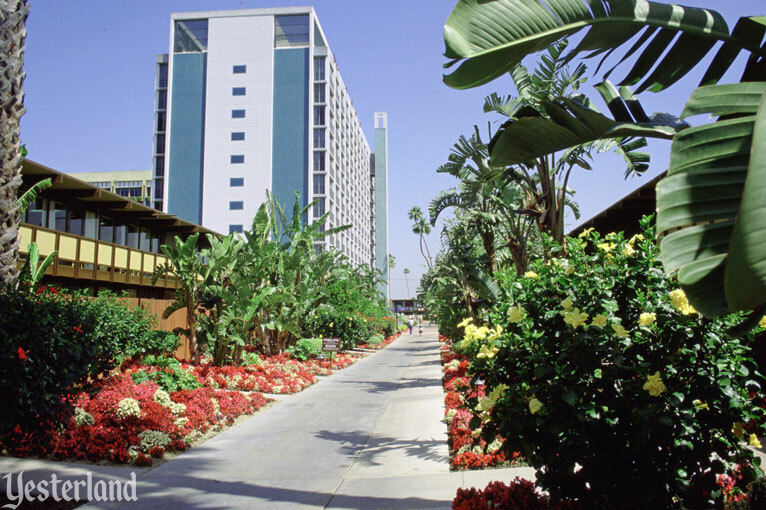 In 1991, the exterior elevator and 11th floor lounge reopened. But now it required a concierge key card to use the elevator or access the lounge. The glass elevator wasn’t such a good thing anymore. For concierge guests, it made more sense to use an interior elevator to access the 11th floor from the 8th, 9th or 10th floor—instead of going all the way down to the ground level first. 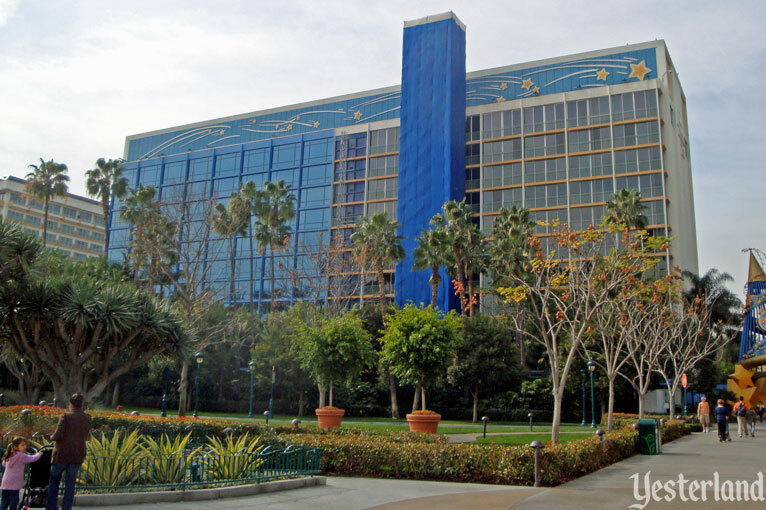 For other guests, the prominent glass elevator was a bit of an insult—despite the high prices for all Disneyland Hotel rooms, they couldn’t use it. 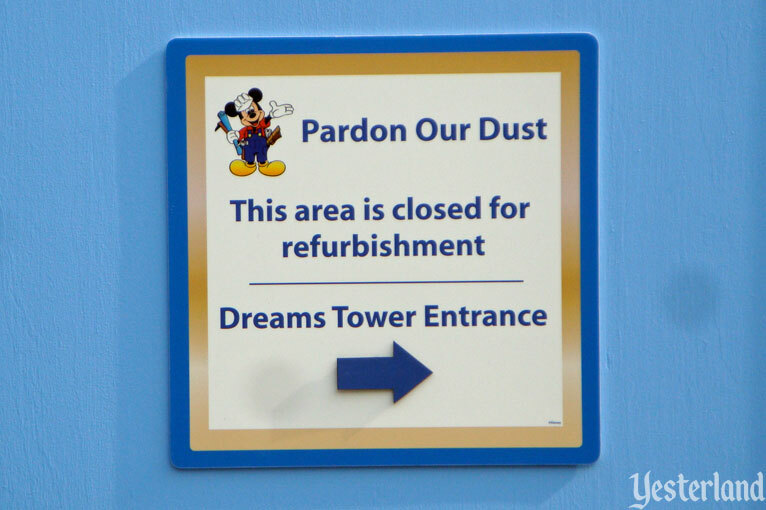 In 2007, Disney changed the name of the Sierra Tower to the Dreams Tower. 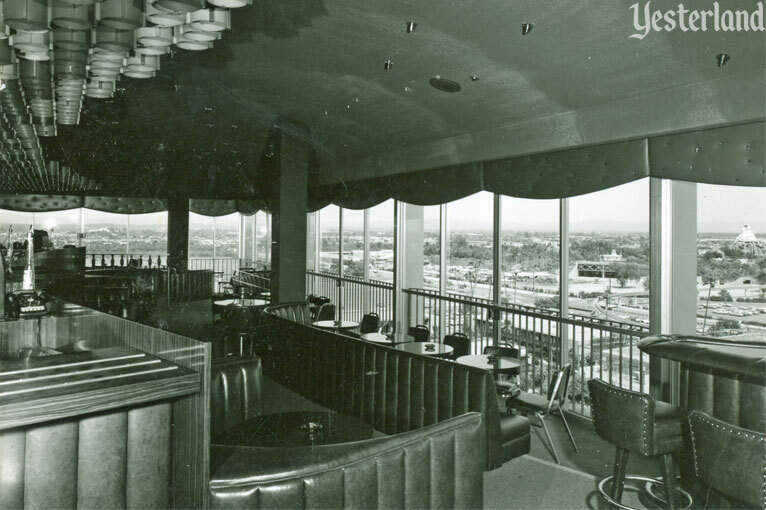 The 45-year-old glass elevator still served concierge guests who wanted a quick trip from the ground level to their lounge. The press release said nothing about the elevator. 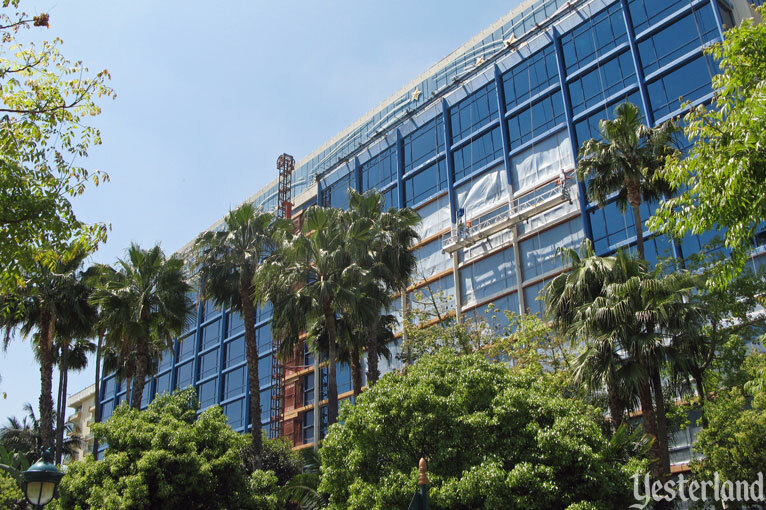 At the Sierra Tower, construction walls went up. New blue glass and blue trim began to replace the previous exterior. And, most strikingly, the former Looking Glass elevator and its track were entombed in blue material. Good bye, Looking Glass elevator. The wrapped scaffolding was consistent with proper demolition when asbestos is present. Although there was no official word, the consensus was that the elevator would not be replaced. It had stopped serving its original purpose long ago. In 2010, all traces of the Looking Glass elevator disappeared. The Dreams Tower, clad in blue glass, became the Adventure Tower. 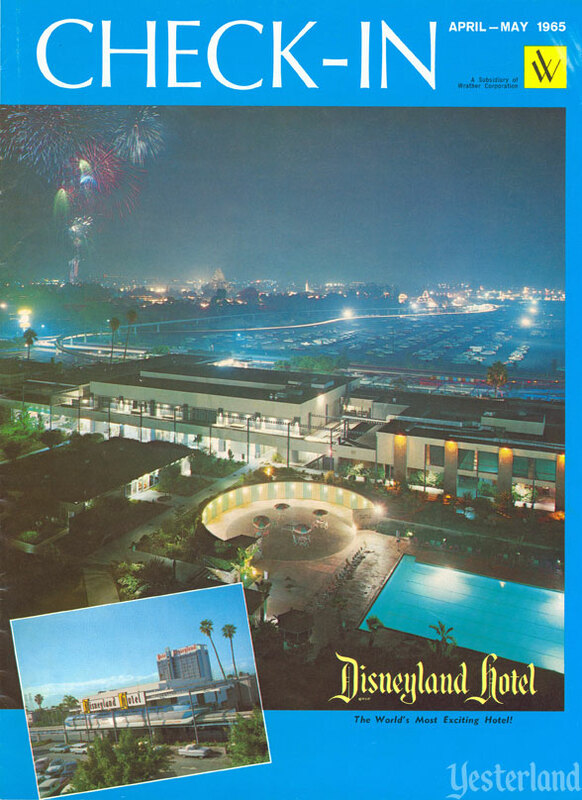 This article ends with a “then and now” comparison from a 2015 Yesterland article, Disneyland Hotel, Then & Now, Part 1: Wrather Years and 2015. The first tower at the Disneyland had four different names since 1962. Did you catch them all? 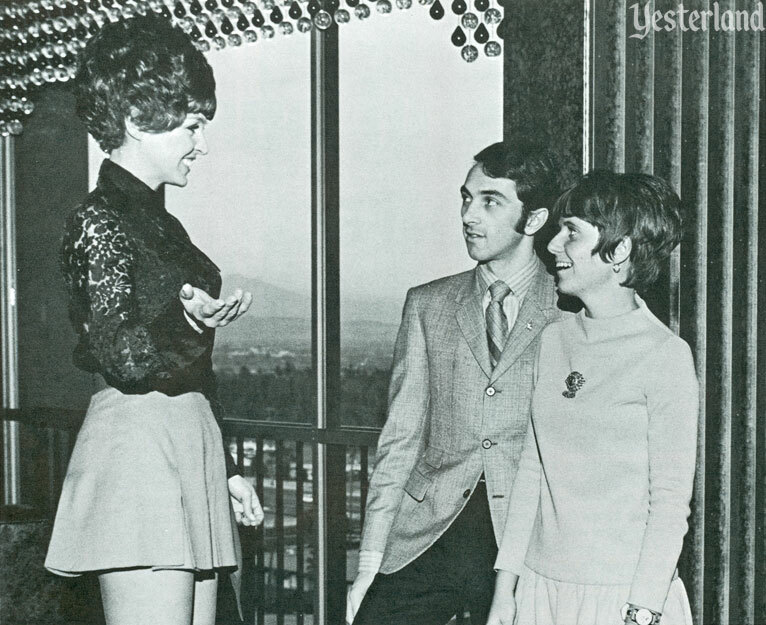 Thank you to Don Ballard for the historical images of the Looking Glass elevator and his assistance with this article. Except as otherwise noted, historical photos and scans courtesy of the Wrather family and/or the Wrather Archives at Loyola Marymount University, courtesy of Chris Wrather and the family of Jack Wrather; some images originally copyright Wrather Corporation, which was acquired by The Walt Disney Company in 1988.